Philosophy – What is a Progressive School? Remember when all we hear in the classroom is the teacher’s voice because we were told to keep quiet the whole time? The learning process is a 2-way street. Encouraging learners to ask questions in the classroom, deepens their curiosity and makes them more engaged in the topic being discussed. 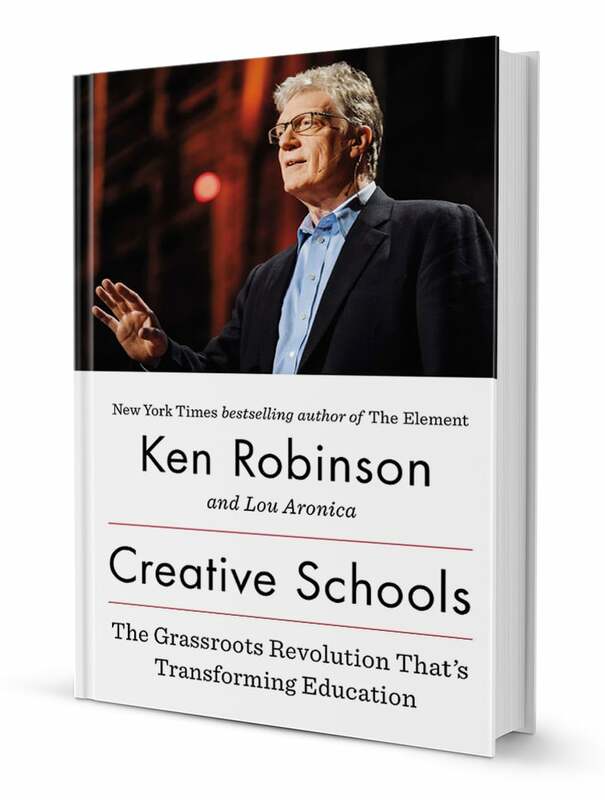 The most downloaded and watched TEDTalk is Sir Ken Robinson’s “How Schools Kill Creativity”. Let’s be part of the statistic and watch it because it sums it all up..
Schools should focus more on critical thinking rather than information. Robinson says that they should be data-driven and not data-informed. Kids these days are in the middle of information explosions. They are bombarded with so much information online and even offline. They need to strengthen their critical thinking to know how to make use of these data, how to incorporate it correctly in his life and how to determine the truth from fallacy. Children should be able to communicate their thoughts and express their feelings well. They should also be allowed to express it not just in written and verbal form but also in other media like the arts, dance, theater, etc. Children are social beings and an important skill is for them to be able to work/play well with others. Bouncing off ideas with one another not only strengthens their social domain, but also encourages good communication and critical thinking. Major behavioral problems like bullying, prejudices, and violence stem from the inability of a child to empathize with others. Together with Collaboration, schools should have a culture of Compassion all the way from teachers being able to understand the plight of their students up to students being sensitive to the needs of the people around them. A lot of times, Conduct is only based on how the child behaves in the classroom, during class. Conduct is how a child conducts himself whether the teacher is looking or not. There are a lot of cases these days of children going through depression, anxiety and severe stress. Children need to develop not only compassion for others but also compassion for themselves. Schools focus more on the outside world when there is an inner world that kids dwell in daily which is built by their ability to control, understand and connect their feelings with what is going on around them. Socio-emotional development should be as important as cognitive development which is why schools should have programs that encourage kids to digress, step back, assess and express how they feel. The progressive theorist John Dewey said, “Democracy has to be born anew every generation, and education is its midwife.” Children should be sensitive to the current events of the world around them be able to understand and have an opinion on their rights, on the responsibility of government and the laws that protect them. Schools should not just talk about this in Social Studies but rather develop a sense of citizenship (not necessarily conformity) and love of country. The Department of Education under the directive of Bro. Armin Luistro is headstrong in implementing a k+12 program. All I can say is.. it’s about time! The Philippines is the only Asian country that has 10 years of formal education compared to our international neighbors having 12. This hit close to home when my eldest daughter could not apply for a scholarship in Japan because she needed another 2 years of schooling. Meaning, she can only apply to study college abroad after studying for two years in a local college! With the k+12 program, every Filipino student will go through Kindergarten, 6 years of elementary, 4 years of junior high school and 2 years of senior high school. The present program is cramming 12 years of skills into 10 years of schooling. The lack of time forces the schools to speed read through the curriculum in order to graduate after 10 years. So far, the best part of what I read about the k+12 program is its seeming inclination to be a progressive curriculum. To use a Ken Robinson term, it is more organic than linear. The first coup was when Bro. Armin, declared that Grade 1 should only be 4 hours instead of 6 hours. According to Luistro, education should be fun and the number of hours would ensure quality and not quantity education. Hurray! I thought I would never hear the words ‘fun’ and ‘learning’ in a sentence coming from the Secretary of Education. Here’s another point that would make my own father fall from his seat. The last 2 years of Grades 11 to 12 will be more vocational in order for the student to have an option of not pursuing college and still be equipped to join the workforce or ideally, pursue a passion or a strength. Not going to college in the Philippines is a taboo that make parents raise eyebrows and wonder what the hell is wrong with this picture?! Personally, I think telling your parents you’re not going to college is about the same as telling them that you’re hooked on drugs…seriously. This is because we think of college as the finishline, the coveted prize or worse, the saving grace of every student. It is not. How many people do you know are now doing things that have nothing to do with what they took up in college? I’m not saying that children should not go to college…I’m saying that there should be other options specially for those not cut out for it. As in any national plan, the intent is pure and well-intended but what hurdles will DepEd face to achieve this gargantuan task? I purposely did not list down Cost as one of the hurdles because that always goes without saying if referring to a government program..
1. Teacher Training. I spoke to 100 public Kindergarten teachers a few months back and the hunger for training was palpable. These teachers not only teach a Kindergarten class of 60 students in the morning, they also a teach a Grade 1 class of 100 students in the afternoon! If they are not properly trained, they will not only suffer burn out but their stress and lack of training will definitely affect the children they teach. 2. Class size. If the DepEd wants a more learner-centered curriculum, the teachers should be trained how to divide these classes into smaller, skill- and level-directed groups. It is impossible to execute a learner-centered curriculum with a class ratio of 1:60 (1 teacher is to 60 students). If new classrooms cannot be built then more teachers are needed in the classroom to break down the class into smaller , more hands-on group. 3. Parent Education. Parents automatically reject the k+12 program because of the seeming additional cost. DepEd should be able to justify the importance of the program by continuous information dissemination. 4. Goals. You can’t say you won in darts when there is no bull’s eye. If the k+12 program will improve and uplift the quality of education in the country, DepEd should set quantifiable and quality-assured goals to measure its success. This goes all the way down to having individual behavioral and cognitive goals for every student, every class and every school implementing the program. Inspite of all the things being thrown at the Department of Education for implementing k+12, I am still hopeful that it will be the program that the department sees it to be. Let’s pray that the political will remains consistent until its full implementation. The fundamental issue is not of new versus old education nor of PROGRESSIVE against TRADITIONAL education but what, if anything whatever, must be worthy of the name EDUCATION. Progressive School: Fact or Fiction? I couldn’t believe my ears when I heard a professor from a prestigious university said that there is no such thing as a progressive school in the Philippines and if there is, then they’re just making things up. WOW! That blew my mind. I wanted to automatically face that professor and tell him a piece of my mind until I realized.. hey, we ARE making things up! We’re making up a curriculum from the interests of our students, we’re making up activities that are integrated through the subjects and we are making up projects that stem from the imagination of our students! A lot of misconceptions are being bandied about our beloved progressive schools that I think it’s about time to clear some things up. FICTION. Progressive schools encourage children to be outspoken and allow their ideas to be heard. Someone who is used to the convent-like silence of traditional and montessori schools may read this to be misbehavior or rowdiness. But stop for a second and LISTEN to the noise. You’ll be surprised on what you can harvest from all that conversation. Ideally, the teachers are part of the “noise” too. Their role is to manage the ideas and words of their students and keep boundaries on how students should be speaking to one another and to other adults. Freedom may sometimes be read as lack of order. There is order but not the order that we have been used to growing up in a traditional school. I know the term “organized chaos” has grossly been abused but that’s the best description of the feistyness that we see in students of progressive schools. They’re free to speak their minds however they are not free to be disrespectful in their words. They’re free to be angry at someone yet they’re not free to hit in anger. 2. Where are the worksheets and textbooks? Progressive Schools have no curriculum. FICTION. There IS a curriculum. There IS a guide called a scope and sequence that teachers follow to check the skill level of each class. It’s the flexibility of implementing the curriculum that creates an illusion that it doesn’t exist. Why can the teacher change activities during class? Why are there no preschool textbooks? This is not a loss of structure. This is the adaptation of the structure to the ones who are in the center of it — the students. And then (as my audiences invariably point out) there are parents who have never been invited to reconsider their assumptions about education. As a result, they may be impressed by the wrong things, reassured by signs of traditionalism — letter grades, spelling quizzes, heavy textbooks, a teacher in firm control of the classroom — and unnerved by their absence. Even if their children are obviously unhappy, parents may accept that as a fact of life. Instead of wanting the next generation to get better than we got, it’s as though their position was: “Listen, if it was bad enough for me, it’s bad enough for my kids.” Perhaps they subscribe to what might be called the Listerine theory of education, based on a famous ad campaign that sought to sell this particular brand of mouthwash on the theory that if it tasted vile, it obviously worked well. The converse proposition, of course, is that anything appealing is likely to be ineffective. If a child is lucky enough to be in a classroom featuring, say, student-designed project-based investigations, the parent may wonder, “But is she really learning anything? Where are the worksheets?” And so the teachers feel pressure to make the instruction worse. 3. Progressive schools do not let students memorize facts. The students don’t learn anything. FACT and FICTION. Why both? Well, progressive schools do not aim for students to recite facts from rote memorization. Progressive schools aim for students to understand the facts and therefore having them remember them longer. Now compare this to a child whose teacher just makes him memorize Monday to Sunday like a drill sergeant everyday. He may be able to remember this during a test but I’m sure he will completely forget this after. There is no connection to his real and everyday life. 4. The students are having too much fun. They’re just playing and not learning anything. Who ever said that learning should not be fun? Or that there can never be anything learned by playing? I wonder how that person is as an adult… In the days of the dinosaurs (ok, I exaggerate..), children were pictured chained to their desks, seriously writing on a piece of paper when in school or when in the process of learning something. This image, in reality, hasn’t left the memory of today’s parents. There is a stigma when a child utters the sentence, “Oh, we just play in school.” It’s like laughter does not equate to active learning. The Disney movie “Monster’s Inc.” depicted a monster world whose primary source of energy was children’s screams of fear. Their energy supply was so low because children were not easily scared anymore. They then realized that children’s laughter offered 10 times more energy after a child accidentally laughed in their power plant. I wonder when this accident can happen in our world?! Fun is socially not equated with learning because the concept of school was not equated with a place to have fun. And we wonder why as adults we also view ourselves in the workplace with a ball and chain. There are numerous other fictional or might I say, urban legends about progressive schools. But the number one enemy of the philosophy being implemented in them are traditional expectations. Even after numerous parent seminars or orientations about what a progressive school represents, it is still a struggle for progressive schools to break the barrier that our traditional upbringing has seared in our ideas about education. Sadly, some progressive schools have been swayed to just adapt to this traditional pressure rather than uphold the progressive philosophy.Let’s hope they also read this post. The Progressive Philosophy is always being compared with the Traditional Philosophy of Education. I’m not surprised. It’s like comparing a stranger with someone you’ve known all your life. Not everyone knows, though, that there are actually 3 philosophies that need a side-by-side comparison. 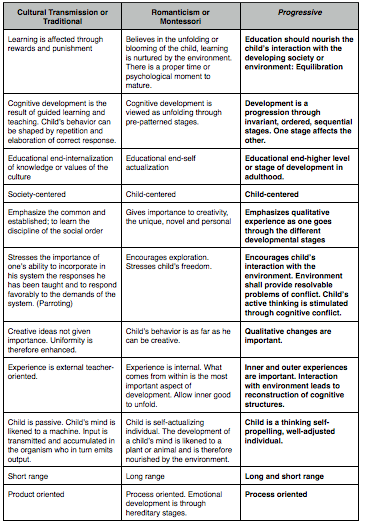 Add Montessori to the mix of philosophies and we have everyone Googling Traditional vs. Montessori vs. Progressive. Well, Google no more (or probably welcome to the site after Google directed you here). I want to give credit to my Family Life and Child Development degree professors for coming up with this (but italics and further explanations were added by the author)! I was browsing through Alfie Kohn’s article about Progressive Education and revisited the concept of Active Learning vs. Memorization. Read this conversation that he cited in his article. Check out the highlighted last paragraph. “OK, easy dad! A ball bearing is blah blah blah.” A verbatim repetition of the definition she had learned from the teacher. To make a long story short, he continues, “I turned over the ottoman, which is on wheels, and showed her the ball bearings, and her eyes got wide. There are only 3 kinds of schools — Traditional, Montessori and Progressive. You first have to determine the kind of school that you feel can best benefit your child. Every school should have one. If the school says they are eclectic, BEWARE. Why? Merriam-Webster defines the word eclectic as composed of elements drawn from various sources. In my language, that just means that the school isn’t sure what their philosophy is and is only catering to all philosophies for marketing purposes. A school without a philosophy is like a ship without a rudder. It doesn’t know where it’s going. So when you enter the school you’re checking out for your child, ask the director or the teacher what their school philosophy is. If you come out of the school still uncertain, then go back in and ask it AGAIN. I, personally, love it when parents ask a lot of questions. It means that they are very interested to learn how the school will educate their children. It also gives the school the opportunity to explain its philosophy and its curriculum. Since progressive schools are the IN thing nowadays, most schools claim they are progressive even if their practices say something different. For example, a preschool that has a big class size cannot claim to be progressive or a preschool that is divided into subjects instead of routines cannot claim to be progressive. Just like a preschool cannot claim to be a Montessori if they do not have the Montessori learning materials. What questions can you ask the director? 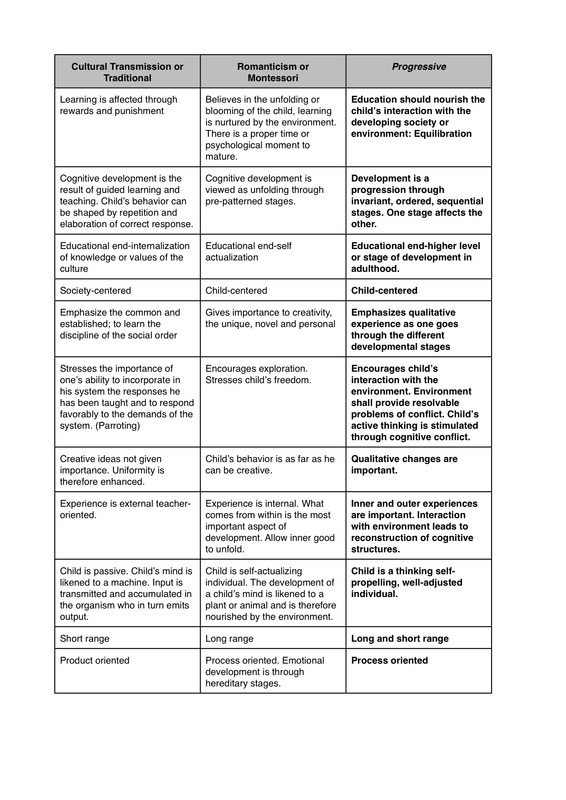 Is the curriculum child-centered (progressive, Montessori) or teacher-centered (traditional)? I know, I know.. my progressive leanings are obvious..hence the title of the blog!